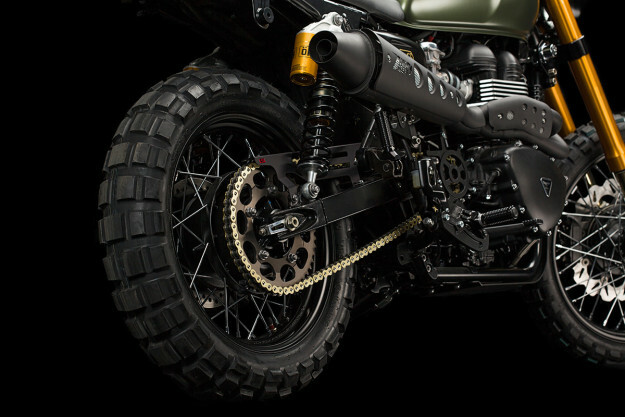 The Triumph Scrambler’s biggest selling point is its looks. It might not be the strongest contender in the performance department, but it has a nostalgic appeal that few others can match. And it’s easy to upgrade. 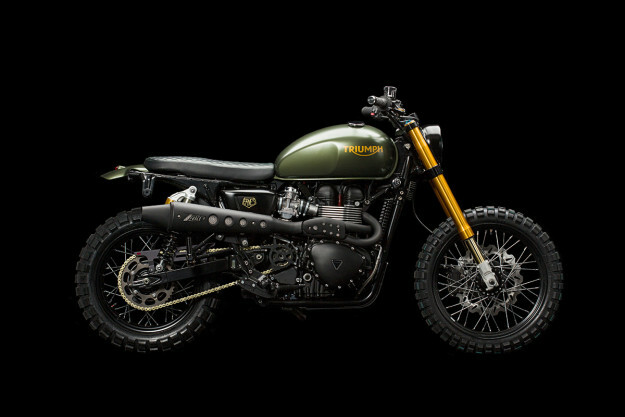 This stunning Triumph Scrambler was built by Erne’s Euromotos—a dealership and custom shop in Zürich, Switzerland. It’s the perfect blueprint for anyone wanting to transform his or her own Scrambler with performance-based mods. The engine gets a big power boost via larger valves, hotter cams, and a higher compression ratio. To increase airflow, Erne’s modified the air box, fitted a free-flowing filter, and installed a Zard exhaust system. The fuel injection was then remapped—making this particular Scrambler good for a reported 95hp. Given this significant jump in power, suspension and braking upgrades were in order. 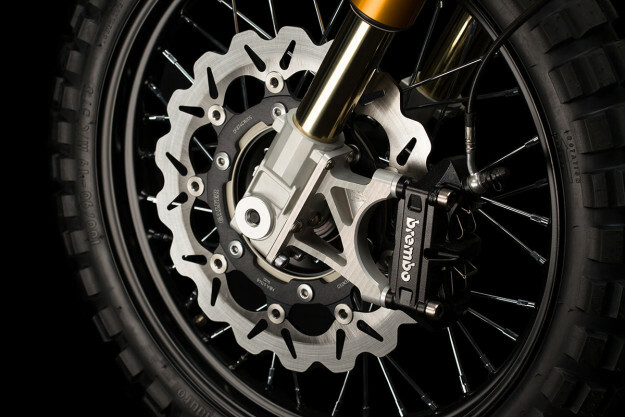 A Brembo P4 braking setup was added at the front, along with a Galfer disc designed for the Thruxton. Öhlins suspension components were set up at both ends: FG324 upside-down forks at the front, and S36P shocks out back. The forks are held in place by new triple trees from LSL, and the tires are Continental’s dual-sport-specific TKC80s. LSL also supplied a set of X01 Superbike bars, bar risers, and adjustable clutch and brake levers. Other (less obvious) LSL parts include a chain guard, sprocket cover, main and passenger foot pegs and foot controls. The regulator, ignition and horn have all been relocated to clean up the front end as much as possible. Erne’s dipped into the JvB-moto catalogue too—fitting a JVB headlight, side panels and rear fender. 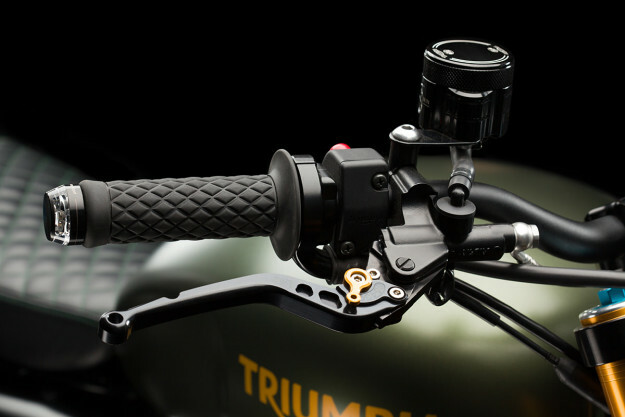 A Motogadget Motoscope Tiny speedo was installed via Motogadget’s m-TRI: a signal adapter designed specifically for plugging Motogadget components into modern Triumphs with minimal fuss. 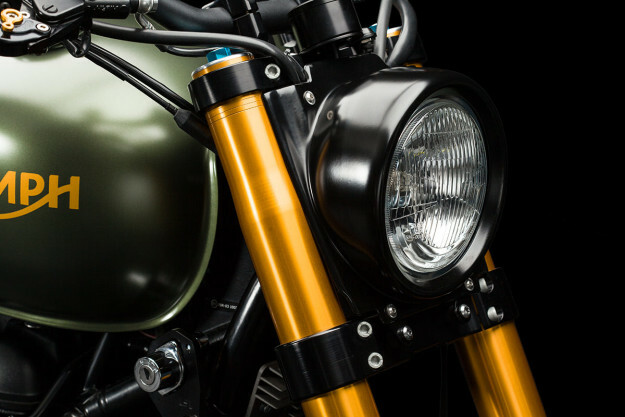 The bar-end turn signals are Motogadget’s m-Blaze Discs. After a little back-and-forth on paint, the client settled on a satin olive green for the tank and fender. The Triumph emblem on the tank and Erne’s logos on the side panels were done in gold, taking cues from the distinctive Öhlins components. Gold highlights can be found elsewhere too: like the adjustment dials on the levers. 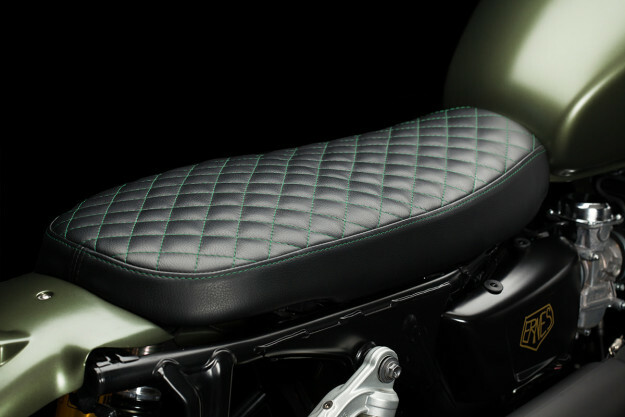 Rounding off the bike is a slimmer, shorter seat with custom upholstery. The diamond-stitch pattern has been created with a green thread that’ll darken over time to match the tank. 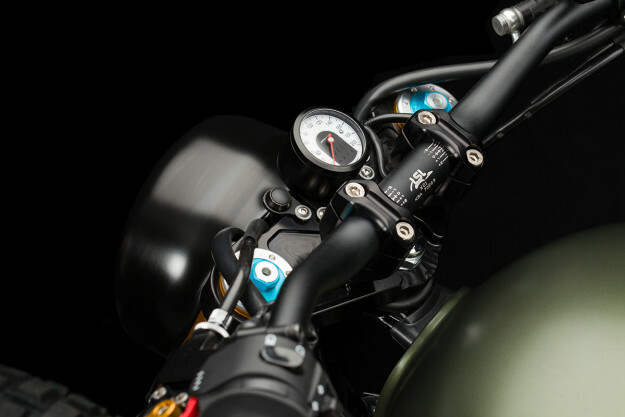 That pattern is replicated on the grips—a pair of Biltwell Thrusters—which is typical of the well-considered detailing on this project. The Scrambler’s brawny stance and olive finish have earned it the moniker Le Chasseur (‘The Hunter’). 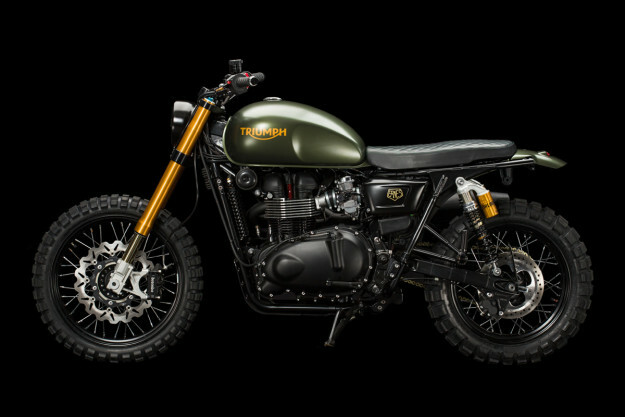 A fitting name for a Scrambler that’s right on target.